Installing low voltage landscape lighting is a fairly easy DIY job. Here are five things to consider before you get started. You’ll need three things before you can start: a Transformer, Cable, and the Lights. The total is the transformer size, in watts, that you’ll need. You can remove the guesswork by choosing a complete landscape lighting kit that gives you everything you need. You can plug most low-voltage transformers into a GIF grounded outdoor outlet just like you would any lamp. Save on cable by finding an outlet closest to your lighting needs. We recommend simply running cables along the ground and tucking them behind plantings or covering them lightly with dirt or mulch. 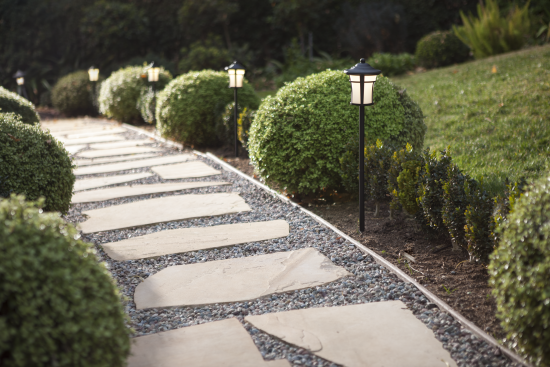 Most light fixtures include stakes so you can simply insert them in the ground. These lights use less energy, allowing you to run your system on a smaller, less costly transformer…and they last far longer than other bulb types, with virtually zero maintenance. A little light can go a long way outdoors. Create layers by using a combination of path lights, up lights and flood lights. That’s it – now go start planning! 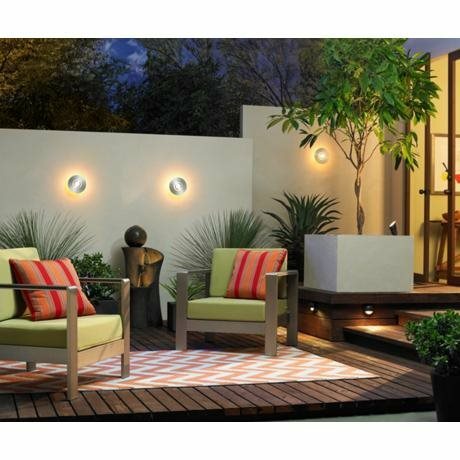 Shop our entire line of landscape lighting and accessories for everything you’ll need. For in-depth help, call us at 1-800-782-1967 or visit a Lamps Plus store near you. One of our American Lighting Association trained associates will be happy to assist with all your landscape lighting needs.